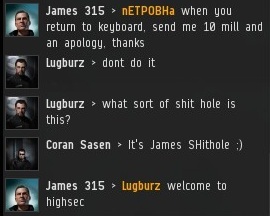 Highsec is a paradise in progress. 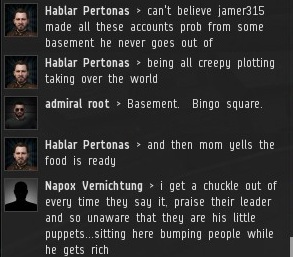 Today's ray of sunshine comes to you straight from the thirty-first edition of the Highsec Miner Grab Bag. Black Panpher had a very common first reaction to the New Order--we'll be forgotten in a month. Then again, this particular screencap was taken about six months ago. Kiltania was amazed to discover that she might need to pay attention to local chat. What do these carebears think it's there for? Kiltania vowed revenge. We know how this is going to end, but it's worth pointing something out: Carebears think ganking is so easy that it needs to be nerfed, yet it's too difficult for them to do. On the other hand, the main reason carebears can't successfully gank is that they usually don't dare to try. Maybe the New Order's courage is what needs to be nerfed? The "good cop, bad cop" routine is the oldest trick in the book. The New Order is too creative and original for such things. Every Agent is "good" Agent. 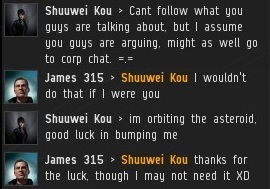 Hundreds of EVE players have been accused of being my alts. Prepare to have your mind blown: I only have one EVE account. 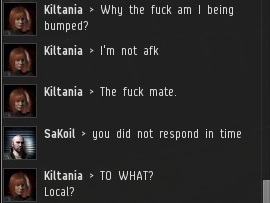 Bumping is the most advanced form of PvP there is. It actually requires manual navigation and leading one's target. A skilled bumper is like a samurai: He earns his power through dedication and training, not expensive ships and mods. Someone contacted Mine Teck and let him know that the shareholders voted to condemn him. He took the news surprisingly well! Aria Stane > Good morning. Aria Stane > "Against New Order?" Mine Teck > Yep. You fight aganst New Ordre. Aria Stane > I'm the alliance Executor of CODE. Alliance... so I... kinda support the New Order. Aria Stane > Are you for or against New Order? Aria Stane > If you're against the New Order, I can't in good conscience accept your ISK and will return it. Mine Teck > I can not see the point of having to pay 2 places, in order to be allowed to play EVE. First, the CCP and then to New Order. Aria Stane > Paying CCP is access to the game. New Order is part of the emergent gameplay within the game you pay to play. 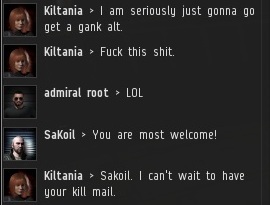 Aria Stane > Okay, I'm going to return your ISK. 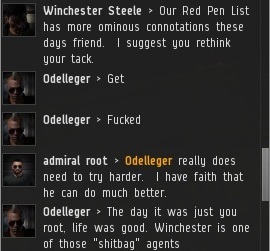 I don't want to take your ISK over a misunderstanding. Mine Teck > OK, Thanks. You are now good enough. Aria Stane > *smiels* I wish you well, Mine Teck ! In another update, Stephen Leibniz earned public acclaim with his honourable deportment during the Questions Three, which he invoked to try to win a free day of mining. Agent Jim Roebuck was so impressed that he purchased Stephen a mining permit. A happy ending! Looks like we're tying up a lot of loose ends in this post. 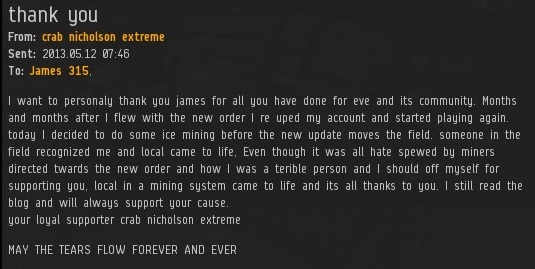 Hero Miner crab nicholson extreme should be familiar to all long-time readers. (If you're new, you can get caught up here.) 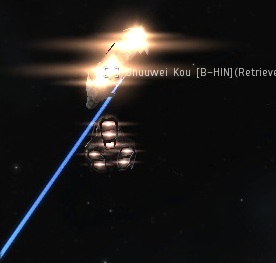 Though the carebears are still angry at him, he hasn't lost a bit of his fighting spirit since he last played EVE. 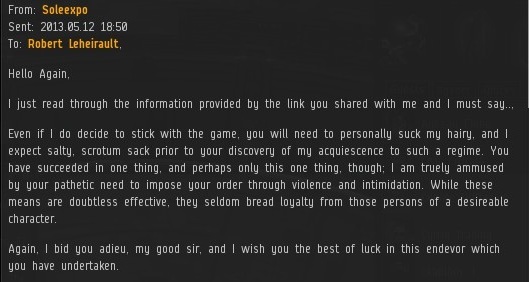 This post is about miner tears, but crab's EVEmail brings a tear to my own eye. ...There, that's more like it, tears in their proper place. After Agent Robert Leheirault received this EVEmail, he encouraged Soleexpo to read the Code. 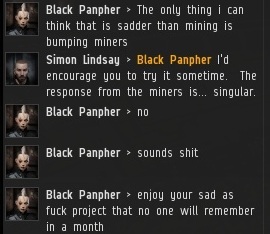 We're not just random gankers; we have good reason to do what we do. The Code is comforting because it reminds miners that they have the ability to avoid death and destruction simply by doing things the right way. The psyche of a hardened rebel miner is twisted, though. They somehow manage to find discomfort in the words of the Code. Extraordinary. As the spotter on the Soleexpo kill, I'm glad to see we had an effect. He was a slippery bugger and warped out on us twice as I tried to get a warpin. It's laughably easy to set up an impenetrable permit tank on any mining barge, yet countless carebears choose to use an inferior tank, harming both their barge's per-hour ore intake and its survivability when the inevitable Catalyst fleet descends upon it. 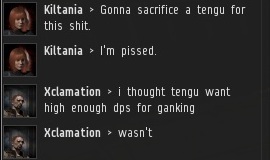 How can these carebears be so bad at EVE? I'm so glad to see crab nicholson extreme come back! it brought a tear to my eye too.